No matter what team you root for, we can all agree that green is a color we want to see more of. And that’s why Suffolk Federal is continuing to expand its transition into the world of clean energy with the installation of solar panels at its Islandia branch. 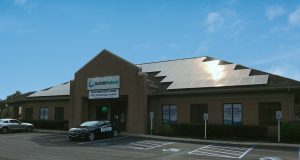 The Long-Island based credit union recently partnered with SUNation Solar Systems to install clean energy solar panels on the rooftop of its Islandia branch. Solar panels reduce the use of man-made electricity by harnessing the power of the sun instead. “We are committed to Suffolk County and feel that it is vitally important to become environmentally responsible and to implement new ways and state-of-the-art green technologies which enable us to be more environmentally efficient, sustainable, conscious and responsible,” explained Ralph D. Spencer, Jr., President & CEO of Suffolk Federal. Locally-founded SUNation is one of the area’s leading installers of solar power technology, working with over 2,500 Long Islanders since its inception 15 years ago. “We embrace Suffolk Federal’s commitment to making Long Island a better place to live and work for generations to come through clean, efficient solar power and are committed to supporting their efforts to continue to ‘Go Green,’” explains Mike Bailis, Co-Founder of SUNation Solar Systems. Suffolk Federal will continue the installation of solar panels in specific branches and moving forward, will build upon ways to expand its use of renewable resources for its more than 59,000 members.